The wind-pumped hydro power station is made up of five wind turbines, with total capacity of 11.5 megawatts, and a new pump storage hydro system, created by turning two natural craters into artificial lakes, one almost at sea level and the other positioned on the hillside above, connected by two pipes almost 3km in length. The beauty of the project lies in its ability to store excess energy from the wind farm in the form of water. In normal, windy conditions, the wind farm serves the local population but extra power is used to pump water from the lower to the upper basin. On less windy days, the hydro system can spring into action. The new project will mean the current oil-fired power generation system will only be needed in emergencies, saving the island from buying 2 million euros a year in oil. The “El Hierro, 100% RES” strategy will give the island a reliable and independent supply of energy. That will be important not only for water supply – 40% of electricity produced is used for water desalination and distribution – but also for the development of agriculture and tourism. The Spanish Regulatory Agency estimates savings of nearly 80 million euros in the next 20 years, to the advantage of the local population since the local authority is fully involved in the investment, operation and management. 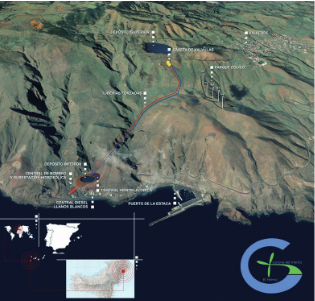 Another great advantage of El Hierro’s energy model is that is easy to validate in situ how a project of this kind could be implemented in other places under similar insulated and dependence conditions. It is not surprising that the project has drawn interest from island communities around the world, been studied by local schoolchildren and closely watched by inhabitants and tourists alike.